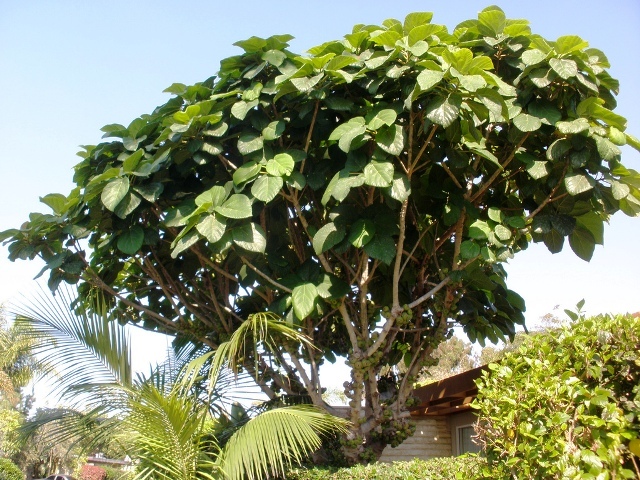 Synonyms: Ficus auriculata, Ficus macrophylla. Indian names: demur, doomoor (Bengal); timbal, gular, tremal (Himachal Pradesh); trimmal, timal, timla (Hindi); karrekan (Nepal); trimbal, trimal, timal, daduri, urmul (Punjab). Taryambal is one of very popular fruits found growing wild in the hills. Its plants can be seen growing in the forests, cultivated fields and in the grasslands. The fruits are very much liked for the jelly-like substance contained in them. If this tree gets a proper supply of water, organic matter, etc., it grows very vigorously. In Himachal Pradesh, it is a very common plant growing at elevations up to 1,700 metres. A deciduous woody tree, having a short trunk, which soon divides into a few stout laterals, which further- branch irregularly, spreading in all directions; height. 10-12 metres; bark, smooth, gray, with a tinge of yellow or green. Leaves, exstipulate, petiolate, each having a 8.5 cm-long petiole, deciduous, obtuse, cordate, entire to undulate, alternate, 21.5 cm long, 23.5 cm. broad, having reticulate venation. Flowers, unisexual; inflorescence, hypanthodium, both the male and female flowers are borne on the fleshy receptacle; the male flowers, 4 mm long; the female flowers, 6 mm long the calyx and the corolla, modified into threadlike scales; stamens, very small, about 2 mm long; style, long, deeply two-branched; ovary, single, ovoid. Fruit, syconoid, globose, having a 4.5-cm-long stalk, 4.5 cm in diameter. 30.55 g in weight, 30.12 ml in volume; the apical opening of the fruit, guarded by scales; mature fruits, 3 yellowish to purple; pulp, light red. The fruit is, in fact, a fleshy receptacle, enclosing a number of true fruits or achenes, which develop from the female flowers lying within this receptacle. Seeds, numerous, very small. They are eaten along with the fruits. The flowering starts from the first week of March and continues till the end of April. 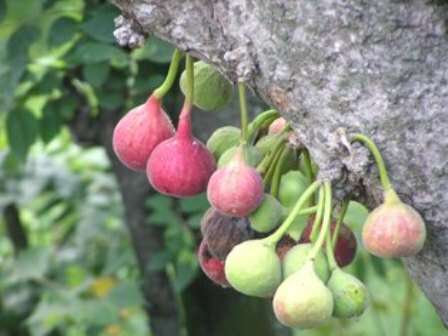 The fruiting season was observed to last from the first week of June to the end of July in the case of the trees marked at the village of Mangoti, near Dharampur (H.P. ), located at an altitude of 1,400 metres. The average yield of a taryambal tree was recorded to be 32.4 kg. The fruit contains 87.1 per cent moisture and 7.5 per cent total soluble solids. The total soluble solids of the sweet jelly-like substance, however, are 9.9 per cent. The fruit is almost devoid of acidity; the total sugars are 6.15 per cent; the reducing sugars are 6.12 per cent; the non-reducing sugars are 0.03 per cent and pectin is 0.48 per cent. The vitamin C content of the fruit is only 3.35 mg per 100 g and this content is rather very low. The protein content of the fruit is 0.59 per cent. The fully ripe fruit contains 1.068 per cent total minerals, as represented by its ash. The percentage content of some of the mineral elements in the fruit, viz., phosphorus, potassium, calcium, magnesium, and iron is, 0.039, 0.331, 0.039, 0.045 and 0.003 respectively. The whole fruit tastes fairly sweet. It is full of an attractive jelly-like substance, which is much sweeter than the pulp. The absence of acidity, however, makes it slightly flat in taste. The overall fruit quality is good. The fruits are very good for eating and the jelly-like substance contained in them makes them very tasty. The fruits should be very suitable for bottling, and work should be initiated on this aspect. The possibility of jam-making from this fruit should also be explored. The leaves are used as a fodder during the winter season and are very much liked by cattle. The leaves are also used as plates by stitching 3-4 leaves together for taking food during feasts in the villages.